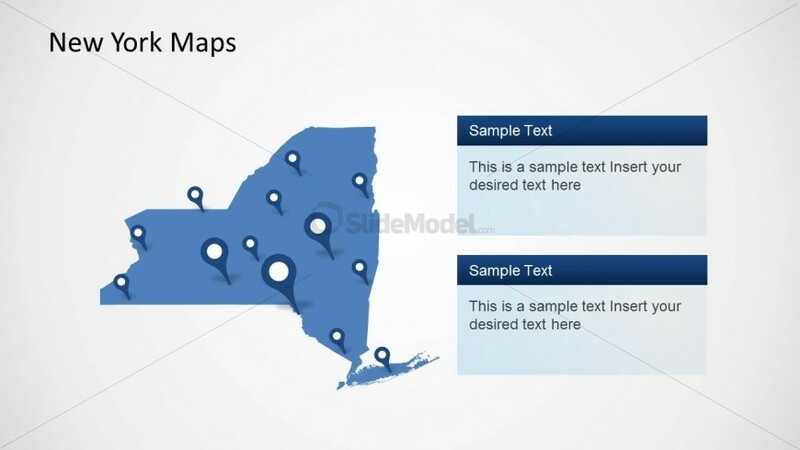 This is a professional PPT template which shows the map of New York with a gray background. It has a pointer which points to a circled locations.The map and the locations are editable. The user can select any area in New York. The Pointers are blue colored with pointed edges and has a white circle at its top and vary in sizes. There are two boxes on the right side of the slide that has Sample Text written on them with a tab of color blue and provides space to write some desired text. Return to New York City PowerPoint Template.